10/2/12 - Acquisitions, Internet website, Exhibition - Nantes, Musée des Beaux-Arts - The Musée des Beaux-Arts in Nantes, currently closed due to work on an addition and general refurbishment, has not however stopped all activity, rather the contrary. The adjacent chapel of the Oratoriens (which will be accessible directly through the central building once the museum reopens), is being used as an exhibition space during this period with works from the permanent collections. 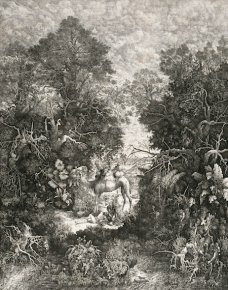 In an understated and very appropriate setting, it is now presenting, a selection of 19th century French engravings and drawings until 29 April. 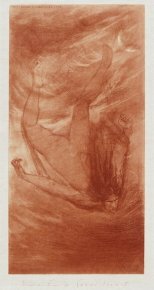 This hang does not have an actual catalogue since a catalogue raisonné of these holdings is to appear within the next two months, excluding however artists with over 100 graphic works in the collection. 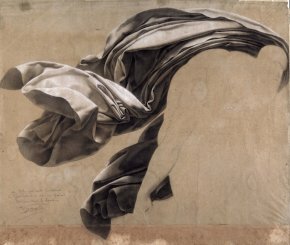 Among these, a native of Nantes, Jules-Elie Delaunay - several sheets appear in the show here (ill. 1) - now has a website exclusively devoted to his work. Extremely well done and userfriendly, it now offers a choice of drawings and paintings, categorized by theme but will soon provide the entire contents of the holdings in Nantes which have been digitized. We should point out that many of these are already available also on Videomuseum. Surprisingly, Nantes owns only sixteen pre-nineteenth century drawings . The exhibition shows that the 19th century holdings are both rich in number of works and in quality but not very diverse and without real unity. There are several significant ensembles by various artists, as well as isolated sheets, but the overall contents are not truly representative of 19th century graphic arts. The hang blends very well-known works, such as the splendid study of draperies by Anne-Louis Girodet (ill. 2) or Odilon Redon’s The Prisoner with other more confidential ones such as the beautiful series of head studies for a decor in the church of Saint-Louis de Paimboeuf near Nantes by the relatively unknown Alexis Douillard or large pastels by the Nantes artist, Alexis Chatron. Among those artists abundantly represented in the museum collections, there are, besides Delaunay, the architects Félix Thomas  and Joseph Joyau (ill. 3), Luc-Olivier Merson for whom the museum received a collection donated in 1925, Henry-Pierre Picou (with a bequest in 1986) and, more recently, Rodolphe Bresdin, with 57 drawings and engravings (ill. 4) donated in 2008 or bequeathed in 2009 by Mrs. Gallico-Bresdin, two offerings we had not yet mentioned on our site here. 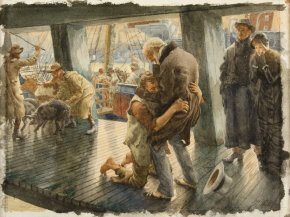 In the same way, we had not alluded to the 2006 donation of a very beautiful watercolor by James Tissot (ill. 5). The engravings are also remarkable. Other than the Bresdin works quoted above, we would like to point out the most surprising works, which represent no doubt the outstanding rediscovery of this exhibition. 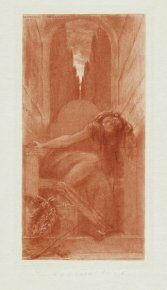 These are by Pierre-Emile Cornillier (ill. 6 and 7), an extremely gifted Symbolist artist now forgotten who had exhibited at the Salons Rose+Croix. The reproduction here of two of his engravings will suffice to give readers an idea of his great talent. 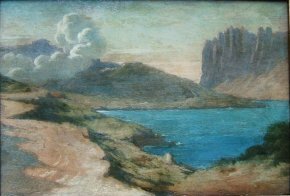 We would also note several drawings in the exhibition by Paul Flandrin, one of whose sketchbooks was purchased in 1996, but visitors will not see a very recent donation from de Bayser Gallery representing a View of a Lake in the Canyons of Provence (ill. 8) as this is a small painted panel and not a drawing. 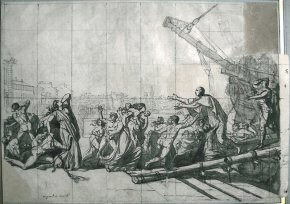 In fact, the museum has recently acquired, from the same gallery, an extraordinary, unpublished, drawing by Louis David, representing The Allegory of the Revolution in Nantes  (ill. 9), a study for a large composition which the city of Nantes was supposed to commission. David came to the city to work there, from March to April 1790, but the project was finally abandoned. 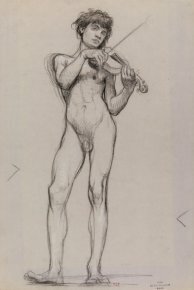 The Louvre holds a sketchbook acquired in 1978 (RF 36.942) where there are several preparatory drawings for this composition, notably sheets 7 front, 8 front where the figures are very close to certain figures in this drawing or the sketch on the back of sheet 8 back, probably a first thought, in a slightly different pose for the woman on the left who is holding a chain and looking upwards. However, old master engravings are quite numerous, since Cacault collected these as well as paintings. 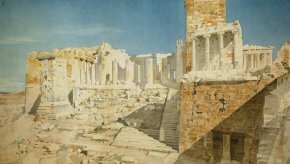 Félix Thomas became a painter after being an architect : see the news item of 1/2/10. The back shows a sketch depicting a city view and several annotations in the artist’s hand.